Have a home that needs cleaning? Care about the health of your family & the planet? 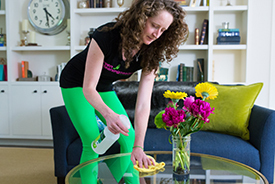 Meet Green Cleaning Seattle – Otium-Maid Services™ – Seattle’s 100% locally-owned & operated green cleaning company since 2008. We’re the only green cleaning company in the NW that has a greened-to-the-core office building. In addition to using biodegradable & fragrance-free cleaning products, our office is solar-run, has laundry-to-landscape washing machines, a 1300-gallon rainwater catchment system, chickens, bees, and more. We promote a culture of respect & care – for our clients, for our work as Green Cleaners & for the earth. We have a thoroughly screened & continually-trained staff. We are licensed & bonded. We are your answer if you’re yearning for a clean, peaceful & cared-for home. Our brick-and-mortar office is on Aurora Ave N between 46th and 47th Ave N.
There are 10 gallons of harmful chemicals found in the average American home?